A zippered pillow encasement that is 100% waterproof, hypoallergenic, and bed bug proof. Made with premium cotton terry, is noiseless, and offers a cool sleep. What makes us different than most pillow protectors found in today’s marketplace is the fact that we use cotton terry for our surface material. Cotton terry is not only the most expensive material used to produce premium pillow protectors, but also requires a complexed manufacturing process. Whether you choose to buy from us or someone else, we would highly recommend only choosing a protector product with a terry cotton surface. Cotton terry is different from a woven cotton surface in that it has thousands of loops that allow air to pass through keeping the body cooler in the summer and warmer in the winter. 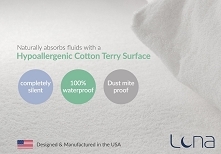 Cotton terry also has an incredible ability to naturally absorb fluids and moisture. Its soft feel also makes it great for the skin and completely noiseless. Fluid spills and incontinence issues with adults, children or animals can quickly turn an unprotected pillow into an ideal environment for dust mites, bacteria, mold and fungus. Cleaning a soiled pillow is also very difficult and often results in chronic odors that can ruin your pillow. Our pillow protectors are completely waterproof and use a hypoallergenic cotton terry surface to absorb fluids. Stains are also repelled, which helps safeguard your pillow manufacture warranty. After a fluid accident, our pillow protectors can be placed directly into the washing machine and tumble dried on low heat. Once dry, simply place the protector back on the pillow and you will be fully protected again. For the ultimate in health benefits and bed bug protection we offer our premium zippered waterproof pillow protectors. With our zippered protectors, your pillow is completely surrounded on all sides preventing bed bugs, dust mites, bacteria and fungus from entering. 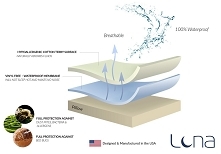 Although the pillow is encased, its still able to breathe properly using our exclusive Luna Airflow Technology. This helps prevent heat buildup and sweating. Bed bugs are becoming increasing more prevalent and can not only ruin your mattress and pillow, but can cause health issues as well. Our pillow protectors are designed for the treatment and prevention of bed bug infestations of the pillow This means that bed bugs are not able to bite through, enter or exit the protector once applied to the pillow. 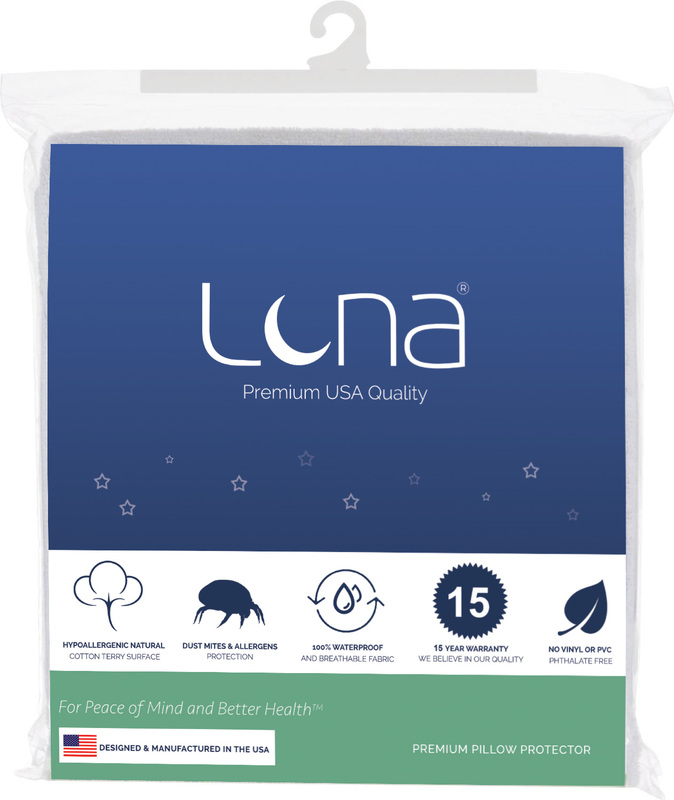 Luna premium pillow protectors are a must have for those suffering from allergy triggers such as pollen, mold, dust mites and fungus. Our protectors are effective in preventing 99% of allergy triggers from penetrating through the membrane cover while still allowing the mattress to breathe. Periodically wash the pillow protector, like you would you sheets, and you'll be able to remove allergy causing triggers that may be resting on the surface of the protector. Our protectors make for a more sanitary and healthier nights sleep (please see our Care Instructions and Dust Mite Section). My daughter has allergies so we decided to try a pillow and mattress protector for her twin size bed. I like the fact that the pillow protector has a zipper so I know nothing can get in. We have taken different steps to reduce her allergy issues, but this was one of the best. We are now back to get a mattress and pillow protector for our bed. Thanks! Got my order in 2 days! The pillow protector meets all my expectations. The description was right-on. I wanted a waterproof protector without the plastic institutional feel. The soft terry cloth fabric is perfect! Since I ordered only a couple weeks before Christmas I was pleasantly surprised when my order shipped out the very next day. The pillow protectors are a great value. I have a mattress protector from "the competition" (which I paid a rather ridiculous price for)and I actually think the Luna is better quality. I know where I will buy my next one!